Trivia: Released during the height of Communist hysteria, the film is a thinly disguised indictment of McCarthyism. The cowardice of the townspeople represents the blacklisting that ruined careers and lives, particularly in Hollywood, all the while supposedly good people were afraid to do the right thing and stand up for those singled out for persecution. 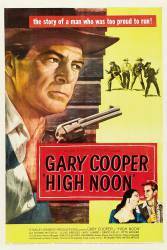 Trivia: The pained expression on Gary Cooper's face throughout the film was genuine; the actor was suffering from a bleeding ulcer at the time of production. Will: I've got to, that's the whole thing. Judge: This is just a dirty little village in the middle of nowhere. Nothing that happens here is really important. Amy: Don't try to be a hero! You don't have to be a hero, not for me.